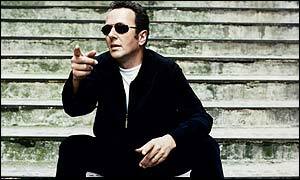 The funeral of Clash star Joe Strummer, who died of heart failure last week aged 50, has taken place in west London. The singer died on 23 December at his home after taking his dog for a walk. It is believed the singer, whose real name was John Mellor, had a hereditary heart condition. Strummer led The Clash from the council estates of Ladbroke Grove, west London to worldwide success in the late 1970s, and recently found more success with his new band The Mescaleros. The service was held in private at West London Crematorium, attended by Strummer's widow Lucinda, two daughters and a step-daughter. The funeral cortege passed what used to be The Elgin pub in Ladbroke Grove, where The Clash played some of their earliest gigs 25 years ago. Strummer's wife Lucinda, who was with her husband when he died, had asked people not to send flowers but instead to donate funds to an Aids charity concert in South Africa that Strummer was due to attend in February. Guests at the funeral are thought to have included his former bandmates Mick Jones, Paul Simonon and Topper Headon. Before Strummer's death, Clash members were believed to be considering a one-off reunion in 2003, as part of their induction ceremony at the Rock And Roll Hall Of Fame in the US. But Strummer was keen to promote the work of The Mescaleros, who had only recently started to get media attention. Interviewed by BBC News Online in 2001, he said of his new band: "We'd like to be known as one of the good groups from London... I haven't even started yet."